A group fighting the fluoridation of drinking water supplies in court has argued tooth decay is not serious enough to warrant imposing it on a whole community. Ann Marie May reports. Opponents of adding fluoride to water supplies say it breaches human rights to protect against unwanted medical treatment, a Supreme Court test case has been told. 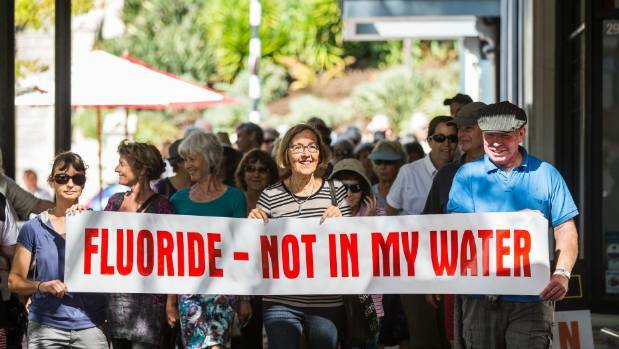 Two small Taranaki towns, Waverley and P?tea, are at the centre of the case after the South Taranaki District Council decided to add fluoride to their water supplies. ?New Health New Zealand has taken on the council and the minister of health, and says fluoridating water supplies breaches the right to be able to refuse to undergo medical treatment. New Health’s lawyer, Mary Scholtens, QC, said about 48 per cent of New Zealand’s water was fluoridated at present, without proof that fluoride was effective against tooth decay. The chemicals used to fluoridate water were byproducts of an industrial process, and could contain contaminants such as arsenic, mercury and lead. It was a different grade from fluoride in toothpaste, or pharmacy-only medicines fluoride tablets. One of the points in the appeal was whether fluoride was a medicine, and whether adding it to a water supply would amount to medical treatment. Under the Bill of Rights, medical treatment can be refused, subject only to reasonable limits. Scholtens said water supplies should not be fluoridated unless the law clearly authorised it. Currently the authority to fluoridate was reached by a complex process, including reference to a Privy Council decision in 1965. The emphasis should be on determining for ourselves what we did with our bodies, she said. Tooth decay posed no risk to third parties and was a manageable risk to the individual, so it was for the council to show why the right to refuse medical treatment needed to be limited to add fluoride to the water supply. Another of New Health’s lawyers, Lisa Hansen, said 500ml of water from a fluoridated supply gave the equivalent to a fluoride tablet that was a pharmacy–only medicine. The case is due to finish on Friday.